Jane Goodall with toy chimpanzee at the University of Hong Kong in 1996. 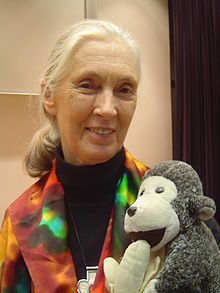 Dame Jane Goodall DBE, born in London on 3 April 1934, is a zoologist. Jane Goodall is a British primatologist, ethologist ,and anthropologist. She is also the UN Messenger of Peace. She is the world's foremost expert on chimpanzees. Goodall is best known for her 45-year study of social and family interactions of wild chimpanzees in Gombe Stream National Park, Tanzania. She is the founder of the Jane Goodall Institute and has worked extensively on conservation and animal welfare issues. She has been interested in animals since childhood. As a child she was given a lifelike chimpanzee toy named Jubilee by her father; her fondness for the toy started her early love of animals. The reason the chimpanzee's name is Jubilee is because in 1935 there had been a chimpanzee named Jubilee also that was born in London and all of the zoo's chimps had been born in Africa. She went to Kenya and met Dr. Louis Leakey there. In 1958, Leakey sent Goodall to London to study primate behavior with two experts. Leakey raised funds, and in 1960 Goodall went to Gombe Stream National Park, becoming the first of "Leakey's Angels". She was accompanied by her mother whose presence was necessary to satisfy the requirements of David Anstey, chief warden. He was concerned for their safety; Tanzania was "Tanganyika" at that time and a British protectorate. Leakey arranged funding and in 1962 sent Goodall, who had no degree, to Cambridge University where she obtained a PhD degree in Ethology. She became only the eighth person to be allowed to study for a PhD without first obtaining a BA or BSc. Her thesis was completed in 1965, titled Behavior of the free-ranging Chimpanzee. It told of her first five years of study at the Gombe Reserve. Goodall has been married twice. On 28 March 1964 she married a Dutch nobleman, wildlife photographer Baron Hugo van Lawick. The couple had a son, Hugo Eric Louis, affectionately known as "Grub," who was born in 1967. They divorced in 1974. In 1975 she married Derek Bryceson. He was a member of Tanzania's parliament and director of national parks; he died of cancer in October 1980. With his position in the Tanzanian government as head of the country's national park system, Bryceson was able to protect Goodall's research project. He put an embargo on tourism at Gombe while he was alive. Goodall is best known for her study of chimpanzee social and family life. She began studying the Kasakela chimpanzee community in Gombe Stream National Park, Tanzania in 1960. Instead of numbering the chimpanzees she observed, she gave them names such as Fifi and David Greybeard, and observed them to have unique and individual personalities, an unconventional idea at the time. She found that, “It isn’t only human beings who have personality, who are capable of rational though emotions like joy and sorrow”. She also observed behaviors such as hugs, kisses, pats on the back, and even tickling, what we consider 'human' actions. Goodall insists that these gestures are evidence of "the close, supportive, affectionate bonds that develop between family members and other individuals within a community, which can persist throughout a life span of more than 50 years". These findings suggest similarities between humans and chimpanzees can be seen in emotion, intelligence, and family and social relationships. Goodall’s research at Gombe Stream challenged two long-standing beliefs of the day: that only humans could build and use tools, and that chimpanzees were vegetarians. While observing one chimpanzee feeding at a termite mound, she watched him repeatedly place stalks of grass into termite holes, then remove them from the hole covered with clinging termites, effectively “fishing” for termites. The chimps would also take twigs from trees and strip off the leaves to make the twig more effective, a form of object modification which is the rudimentary beginnings of toolmaking. "Man the Toolmaker" is a famous phrase in anthropology. In response to Jane's research, Louis Leakey wrote, "We must now redefine man, redefine tool, or accept chimpanzees as human!" Over the course of her study, Goodall found evidence of mental traits in chimpanzees such as reasoned thought, abstraction, generalization, symbolic representation, and even the concept of self. All these were thought to be uniquely human abilities. In contrast to the peaceful and affectionate behaviours she observed, Goodall also found a mean side of chimpanzee nature at Gombe Stream. She realized that chimps will hunt and eat smaller animals such as colobus monkeys. She discovered that chimps will systematically hunt and eat smaller primates such as Colobus monkeys. Goodall watched a hunting group isolate a colobus high in a tree, block all possible exits, then one chimpanzee climbed up and captured and killed the colobus. The others then each took parts of the carcass, sharing with other members of the troop in response to begging behaviours. The chimps at Gombe kill and eat as much as one-third of the colobus population in the park each year. This alone was a major scientific find which challenged previous conceptions of chimp diet and behavior. Also startling, and disturbing, was the tendency for aggression and violence within chimpanzee troops. Goodall observed dominant females deliberately killing the young of other females in the troop in order to maintain their dominance, sometimes going as far as cannibalism.Chimps can do all sorts of things we thought that only we could do like build and make tools and all sorts of other stuff. Goodall saw highly intelligent, emotional creatures living in complex social groups, when other researchers saw non communicating apes. She says of this revelation, "During the first ten years of the study I had believed […] that the Gombe Stream chimpanzees were, for the most part, rather nicer than human beings, then suddenly we found that chimpanzees could be brutal that they, like us, had a darker side to their nature". These findings revolutionized our knowledge of chimpanzee behaviour. They were further evidence of the social similarities between humans and chimpanzees, albeit in a much darker manner. ↑ She was born Valerie Jane Morris-Goodall. DBE is Dame Commander of the Order of the British Empire, a high award given to a few British females. ↑ 4.0 4.1 "Early days". Jane Goodall Institute. 2010. Retrieved 2010-07-28. ↑ 5.0 5.1 "Curriculum vitae: Jane Goodall PhD DBE" (pdf). Jane Goodall Institute. Retrieved 2010-07-28. ↑ 6.0 6.1 The Biography Channel (2010). "Jane Goodall biography". Retrieved 2010-07-28. ↑ 7.0 7.1 Montgomery, Sy (1991). Walking with the Great Apes. Boston, MA: Houghton Mifflin. pp. 125–6. ISBN 0395515971. ↑ "Study corner - Gombe timeline". Jane Goodall Institute. 2010. Retrieved 2010-07-28. ↑ 9.0 9.1 9.2 9.3 9.4 9.5 9.6 9.7 9.8 "Jane Goodall's Wild Chimpanzees". PBS. 1996. Retrieved 2010-07-28. ↑ 10.0 10.1 10.2 "Chimps R Us, on season 11, episode 8". Scientific American Frontiers. Chedd-Angier Production Company. 2000–2001. Archived from the original on 2006. ↑ 11.0 11.1 11.2 11.3 Goodall, Jane. Reason for hope: a spiritual journey. New York: Warner Books, 1999. ↑ 13.0 13.1 13.2 The Jane Goodall Institute: "Chimpanzee Central", 2008. ↑ Tullis, Paul (2015-03-13). "Jane Goodall Is Still Wild at Heart". The New York Times. ISSN 0362-4331. Retrieved 2017-04-26. ↑ McKie, Robin (2010-06-26). "Chimps with everything: Jane Goodall's 50 years in the jungle". The Guardian. ISSN 0261-3077. Retrieved 2017-04-26.